Normally, a quote captures the essence of each children’s book that I select for review. In the case of Seasons of Joy, however, the words are really secondary, compared to the visuals. 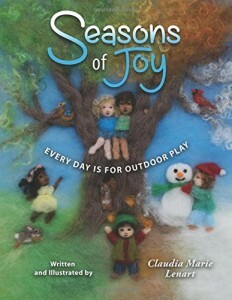 In this very unique children’s book, the author has placed images of her exquisite needle-felted scenes, and then added text to create a picture book for very young children, perhaps age two to about four or five. What makes this children’s book special is that the scenes really invite the children to live into the pictures. They fill the imagination with possibilities that the reader could enjoy – make a snow angel, swim in a lake, make a fairy garden, and more. As someone who has created at least one needle-felted story mat (for my grandson), the one thing I missed at the time were more ideas, inspiration, and instructions. So in addition to creating a children’s book that one could read aloud to young ones, the author also has a blog where she describes in detail how to make these scenes for yourself. And I can say from experience, there is nothing like telling a story accompanied by your own needle-felted scene. I am adding this children’s book to the website because it’s a superb offering to parents of very young children, who might want to also try their own hand at needle-felting. This book is perfect for a Waldorf kindergarten or pre-school as well.